Radio London's Willy Walker visited Britain in July 2004. Now based in Florida, the trip to London coincided with his 65th birthday. What better reason could there be to gather some of the old gang together and raise a glass? 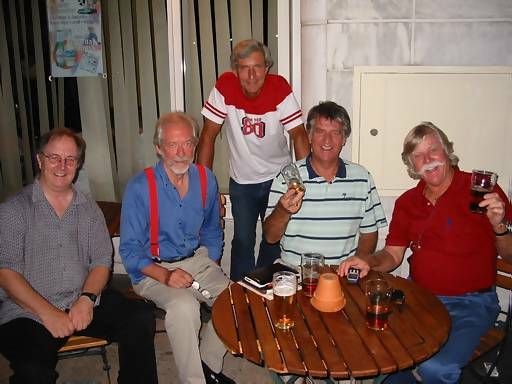 Left to right: Caroline House production man Freddie Ryder, Willy's old flat-mate and Radio London colleague Duncan Johnson, Radio London engineer Dave “Hermione” Hawkins, another former Big L DJ Ed Stewart and the birthday boy himself Willy Walker. Also at the party, but missing when the photo was taken, Tommy Vance. Many thanks to Duncan Johnson for the photo.